A World View Stratolite high-altitude balloon is readied for launch from Spaceport Tucson on Oct. 1. 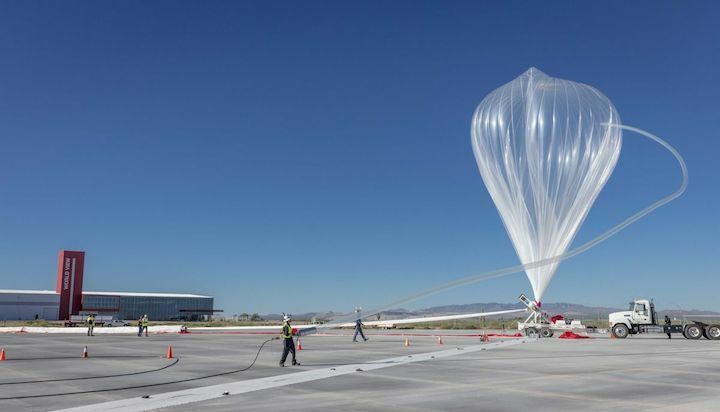 A high-altitude balloon exploded in the early afternoon Tuesday at Spaceport Tucson, a launch site operated south of Tucson International Airport by startup World View Enterprises. 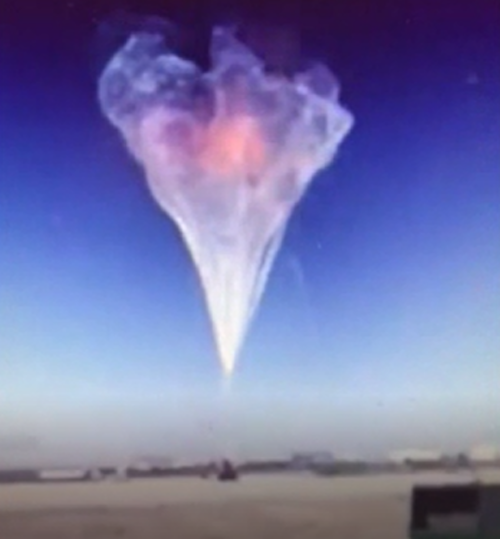 No injuries were caused when a large, tethered test balloon ruptured as crews deconstructed it after a successful ground test to fill the balloon, World View spokesman Andrew Antonio said. The rupture resulted in a loud sound heard in the area, and a small fire on the balloon, he said. "We have reached out to reassure our immediate neighbors," Antonio said. "There were no injuries and only superficial facility damage at the site." World View says it can use either helium or hydrogen gas to fill its stratospheric balloons but has initially been using hydrogen, which company officials have said is safe when handled properly. Raytheon Missile Systems, which operates its airport plant adjacent to TIA and Spaceport Tucson further south, sent an email message to its employees, explaining that a "substantial explosion" at the World View site had caused some minor damage to Raytheon buildings, such as falling ceiling tiles and dust debris, "as well as a litany of shock sensor alarms being activated." A Tucson Fire Department unit was present during the blast after being invited to attend the test beforehand by World View, department spokesman Capt. Andy Skaggs said, adding that there would likely be no further investigation by his agency. World View leases the site from Pima County for high-altitude balloon launches and operates the spaceport under contract to the county. 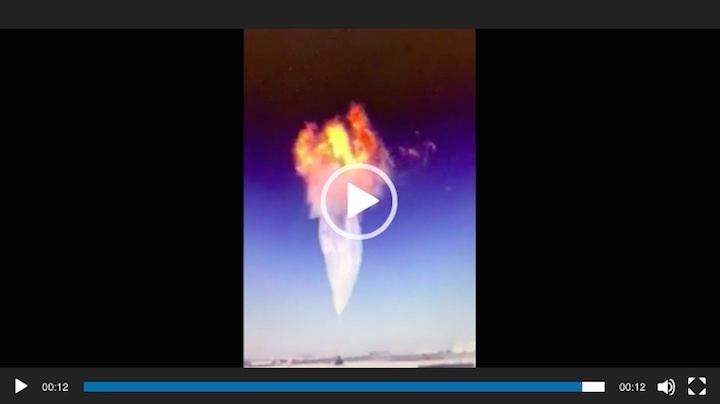 A video obtained by the Arizona Daily Independent shows flames shooting into the sky as a World View balloon filled with hydrogen exploded on Tuesday. The explosion rocked buildings up to one mile away. Employees at nearby defense industry businesses ran out of buildings believing that there was an attack of some kind. Pima County owns the facility and leases it to World View. As yet, the damage from the explosion and costs to taxpayers, if any, is yet unknown. The World View facility was built on land that was intended to serve as a buffer zone for Raytheon. Raytheon has missiles stored in bunkers on its property. World View’s explosion caused ceiling tiles to fall on Raytheon employees, according to sources. According to sources, World View used hydrogen, a very volatile gas, in the balloon. Experts question the wisdom of using such a dangerous gas near a missile site as well as Davis Monthan Air Force base and Tucson International Airport. In May, the Arizona Daily Independent (ADI) reported that Pima County purchased expensive furniture and equipment for World View along with the $15 million the County spent on building the the company’s headquarters and launchpad. Documents revealed “that taxpayers also purchased a tracking antenna for $90,845, a weather station for $148,936, window coverings for $28,015, systems furniture for $190,339, manufacturing specialty furniture for $109,150, and lockers for $10,337,” according to the ADI. The County’s unusual arrangement with World View has resulted in a lawsuit by the Goldwater Institute on behalf of Pima County Taxpayers. “It should not surprise anyone that Chuck Huckelberry is able to find $15 million to build the World View facility which includes close to a million dollars of lavish furnishings and decorations for his cronies, yet he is never able to find monies for the failing roads,” Supervisor Ally Miller told the ADI at the time.